On February 23, 2015, Spotlight featured artist Ayelet Tsabari’s was awarded the Sami Rohr Prize for Jewish Literature for her collection of short stories The Best Place on Earth (HarperCollins Canada). With a reward of $100,000, the Sami Rohr Prize is among the largest literary prizes, and honors emerging writers whose works of fiction explore the Jewish experience. Previous recipients include Francesca Segal (The Innocents) and Matti Friedman (The Aleppo Codex). The Best Place on Earth was previously nominated for the Frank O’Connor International Short Story Award. In 2013, Ayelet was named as one of ten Canadian writers to watch by CBC Books, and in 2014 she was awarded a Chalmers Arts Fellowship. Ayelet had recently kicked of our two-month long Spotlight on Israeli Culture with a talk and a reading from her book, presented by International Festival of Authors, the Koffler Centre of the Arts and Ben McNally Books. 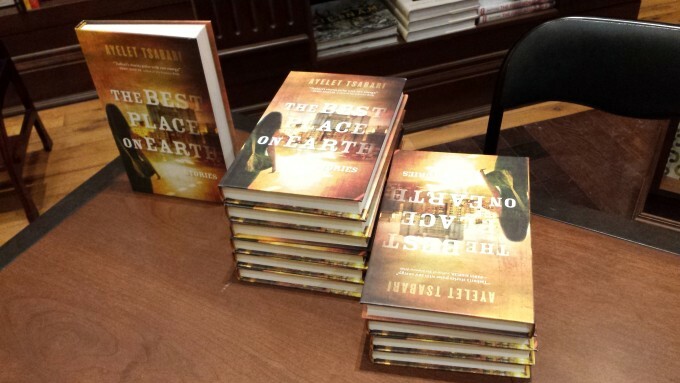 Get your copy of the award-winning The Best Place on Earth.